We make so many decisions in a day that it’s easy to forget the impact that they can have on the environment. The truth is we could all be making better choices for our families and the world, but it doesn’t have to be hard. 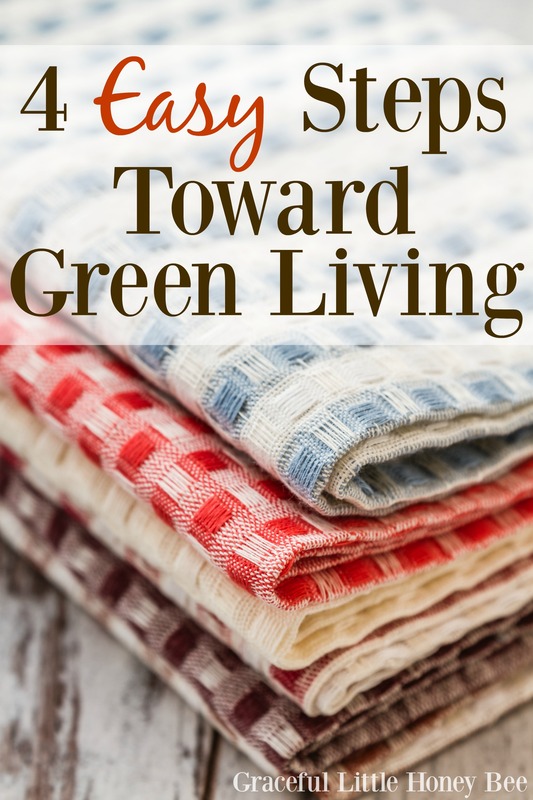 Today I’m going to share with you 4 Easy Steps Toward Green Living. Start practicing these easy habits and soon you’ll be wanting to make even more changes! Using cloth napkins or rags instead of paper towels in the kitchen is a great way to reduce your environmental impact. Dish towels are a great alternative that can tackle any mess or you can even make your own cloth napkins or rags using old curtains, t-shirts, sheets or other discarded items that you might have one hand. Using cloth is not only good for the environment, but it will also save you money in the long run! Another great way to reduce your environmental impact is to bring your own reusable bags to the store with you. I keep several in the back of my car and bring them with me where ever I go. I also have a set of mesh produce bags to use in place of the plastic ones in the produce section. If we all did this, think about how many plastic bags would be saved from the landfill? Buying in bulk not only saves money, but it also saves on packaging which is always good for the environment. As long as you will use what you’re buying it’s a win-win situation for everyone. Most grocery stores even have a bulk food bin section where you can bring your own bags or jars to fill with things such as beans, rice, spices, flour, trail mix, snacks, etc. Many consumers are choosing environmentally-friendly products and more companies are taking notice. Every time you go to the store you have the choice to vote with your dollars on environmentally-friendly options. 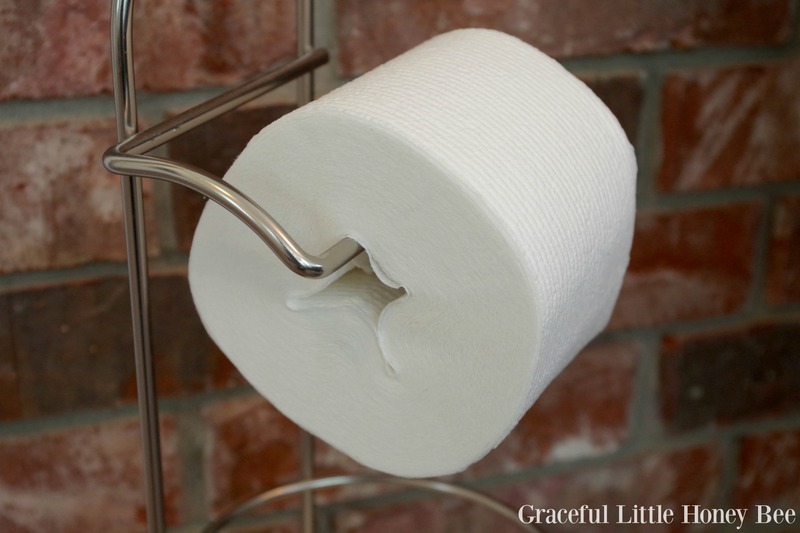 Choosing products such as Scott Tube-Free toilet paper is a great way to lower your environmental impact. 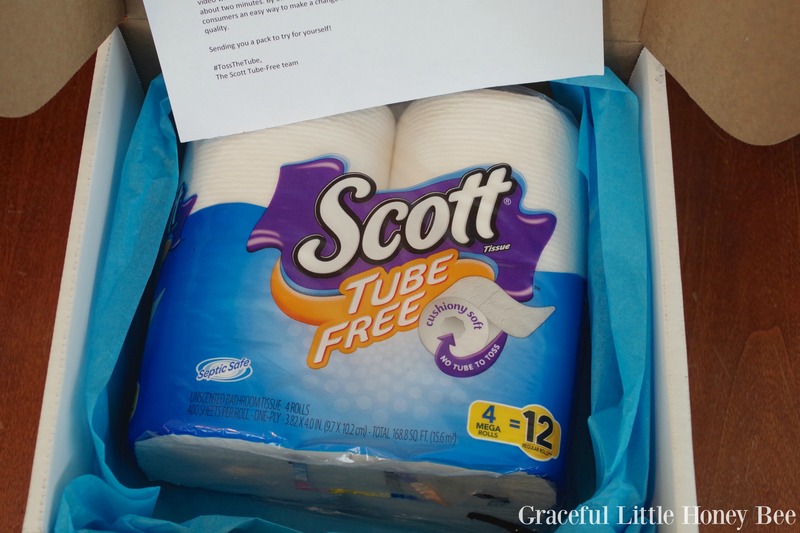 Scott Tube-Free is a new product that looks and feels the same as a regular roll of toilet paper, but eliminates the unnecessary cardboard tube in the middle. Scott Tube-free gives people an easy way to reduce waste without sacrificing quality. How cool is that? Scott Tube-Free teamed up with a YouTube prankster to demonstrate how the toilet paper that we use can make a big impact. His stunt uses 66,000 tubes which is the number of tubes that Americans go through in just over two minutes! Crazy. Click below to watch the video. By making the simple switch to Scott Tube-Free you can save approximately 150 tubes per year from being used! Scott Tube-Free can be found at select retailers nationwide and online. Visit Scott Tube-Free to find a store near you. 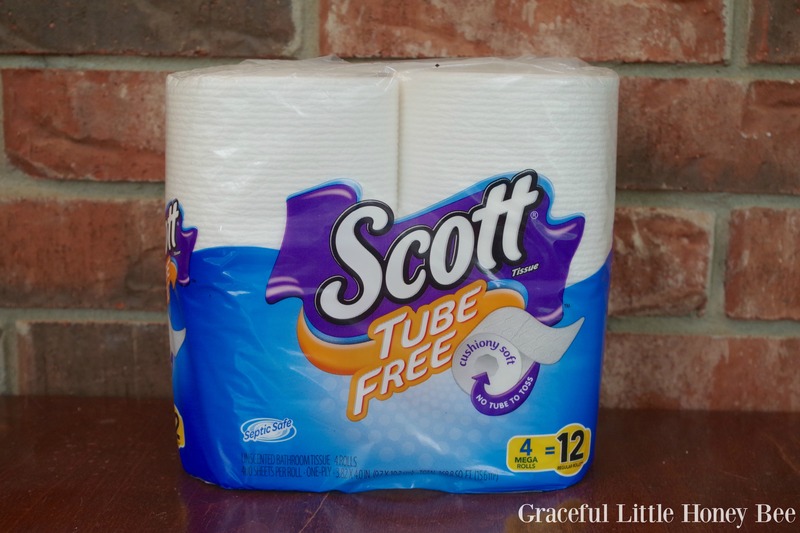 To see how many tubes your household uses and for a coupon visit Scott Tube-Free coupon. Use hashtag #tossthetube when you share on social media! What are some ways that you live a green life? I’d love to know! I save pickle and other glass jars and that is what I use for leftovers and such and when I carry food for a pot luck I also use mason jars for things like celery and carrot sticks , radishes and such makes a really cute display as well and when you are done just pop on the lids and carry them home . I also grow many herbs so I do not spend a great deal of money on spices ( of course I buy things like black pepper, cinnammon and such at places like Sam's or the dollar store you can get really good bargains on spices there. I try to re-use, re-purpose and recycle as much as possible. My husband had a shop vac that died so I took the bottom and made a garden planter out of it, it is great for tomatoes and peppers sometimes I have grown greens in it . We had an old mop bucket that I also turned into a planter , I hate to throw away anything away if I can find a use for it.